Big Chinese investment on hydropower on the river Kwanza, for domestic consumption but also for export to South Africa and possibly for aluminium smelting. Very significant impacts but opposition is limited due to government control. The hydroelectric project Caculo-Cabaça is located in São Pedro da Quilemba, 74 km from Dondo, Cuanza Norte. Financed by China, it is planned to generate 2,172 MW for allegedly allow access to electricity from 30% to 60% of the national population. The construction of the plant started in August 2017 and will continue for the next 5 years approximately. The project was cleared in 2015 and got financing from the Chinese state bank ICBC, who posed the condition that it would be the Chinese consortium CGGC that would build it. According to an article in Spiegel, El Mundo and other sources, the daughter of the current Angolan president, Isabel dos Santos, has a high share in the consortium, which ensures revenues for the ruling family as well.  . The construction at Caculo-Cabaça started the same month of the inauguration of the 2070 MW Lauca HEP along the same river, in the Malanje province. The two plants are second in Africa only to the Grand Ethiopian Renaissance Dam (6,000MW). The government plans in fact is to invest an important amount of resources in hydropower, included in the "Programa de Investimento Público", in order to achieve the goal of 9,000 installed MW potential by 2025. Access to clean electricity and generation of jobs are the two main arguments for big plants, but electricity is also planned to be exported to Namibia and South Africa along an interconnected grid. 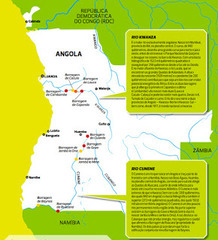 According to the World Energy Council, "Angola’s estimated hydropower potential is 150 TWh/yr, one of the highest in Africa. However, so far only a small fraction of the country’s hydro potential has been harnessed. Feasibility Studies are in progress on major hydro schemes at Lauca and Caculo-Cabaca on the Kwanza river, each with an installed capacity of 2 000 MW, and on a 300 MW bi-national project at Baynes Mountain on the Cunene". According to a study by EXAME, Angola will soon have an installed capacity of 7,000 MW from its hydro sources. Together with the capacity of other plants such as Thermal plants (2,000MW), the Combined Cycle Gas Turbine of Soyo (750MW), and the wind mill in Tombwa (100MW), the country will count on around 10,000MW installed capacity . For the time being, there is very little resistance to such projects in Angola because of the restrictions on organizing by the government. Project Details The plant will have 2,172 MW installed. One part of this might be allocated to domestic consumption but also for export to South Africa and possibly to aluminium smelting (following the steps of Mozambique). A MOU was signed with Alcoa in 2009. Why? Explain briefly. 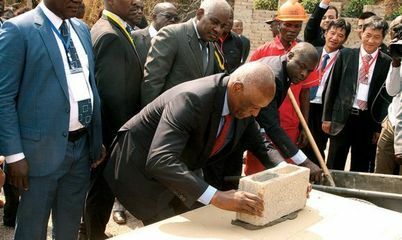 There is very little resistance to such projects in Angola because of the restrictions on organizing by the government. For the time being, the case can be considered a latent conflict, as the impacts will be for sure significant. Micael Pereira (for Expresso, Portugal). Angola: where a father's gift to his daughter is a multi-billion dollar dam contract. EIC 2016 / 2017-08-26. Isabel dos Santos, daughter of Angolan president José Eduardo dos Santos, has won a massive part of a 4.5 billion USD contract to construct a dam in her own country. She used a proxy company registered in Hong Kong to secure the deal approved by her own father, reveals a leak obtained by Der Spiegel and shared with the European Investigative Collaborations (EIC) network.